Imagine a fleet of self-driving minivans. Google has tested its self-driving cars in states like Nevada, Washington and Arizona. Locals near its home base in Mountain View, California, have become accustomed to seeing teeny cars that look like a koala at stoplights. Now, the company will expand its testing to the Detroit area, home base to the U.S. auto industry, to be close to its manufacturing partners. Google (GOOGL) is opening a giant 53,000-square-foot development center in Numi, a city just outside Detroit. The group announced the new building Wednesday in a Google+ post. "Our engineers, working with local partners, will further develop and refine self-driving technology. One of the first tasks will be to ready our self-driving Chrysler Pacifica hybrid minivans," the post said. Earlier this month, Google announced it was partnering with Fiat Chrysler Automobiles to build 100 self-driving minivans. It's the first time Google has worked directly with an automaker. Fiat Chrysler will customize its new Pacifica minivans to fit Google's self-driving hardware and sensors, possibly paving the way for a mass-produced version in the future. Google will also work with directly with the car company's engineers on the project, which is a part of Alphabet's X Lab. A Detroit-adjacent location will give Google access to a new pool of experienced talent and potential partnerships. 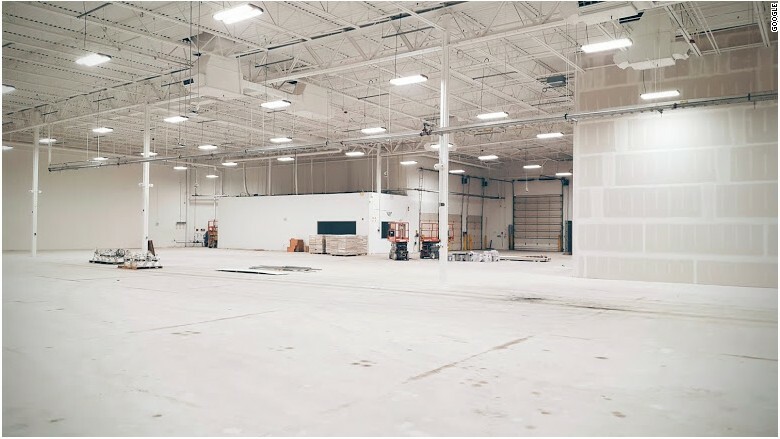 Google said its project engineers and cars will begin moving into the mostly empty space this year.